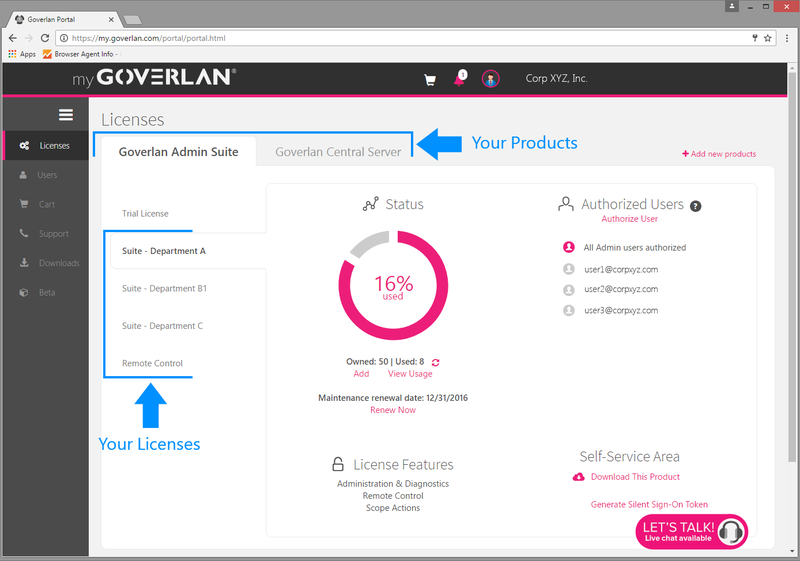 Goverlan Reach features a sign-on based licensing system which can be managed via a web portal accessible at https://my.goverlan.com. 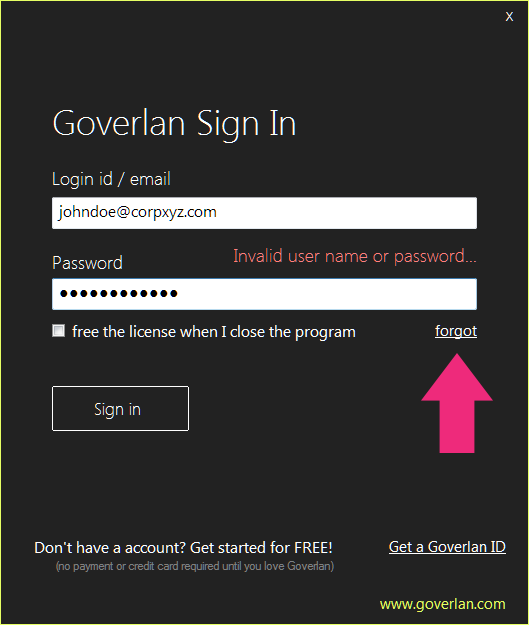 If you are trying Goverlan for the first time, a temporary login id /email and password will be emailed to you. Or you can register for the Goverlan Reach remote access software 30-day free trial on www.goverlan.com. If your company purchased Goverlan, contact the Goverlan license administrator. Each company has a designated license admin, who is able to create new users, assign licenses to users, revoke/reclaim licenses, or perform other administrative tasks. Need to know who your account admin is? Contact our Sales department to inquire. If you are the license admin, login to http://my.goverlan.com to start creating users and assigning licenses. By default, every new account is provisioned with a Goverlan product trial license. The trial license authorizes up to 5 concurrent uses of the software for 30 days. At any time, you can convert this trial license to an active license via my.goverlan.com or by contacting our Sales Department. When purchasing a new license, you can select the delivery model that best satisfies your requirements. Pay as you go – This license model allows you to use the latest version of the software and receive technical support during the terms of your subscription. Once a Goverlan license has been purchased, it may be deployed in two ways. Floating Licenses – This option allows Goverlan licenses to be temporarily deducted from a pool of licenses until Goverlan is closed. Fixed Licenses – This option allows Goverlan licenses to be permanently deducted from a pool of licenses until the Goverlan user signs out of Goverlan. Select free the license when I close the program to acquire a floating license (See Floating vs Fixed section later in this document). NOTE: The name of each license owned can be customized by an account administrator (see Renaming Licenses). If you are using Goverlan within a Citrix or TS farm environment, you must select free the license when I close the program to avoid duplicates in license consumption. By default, license admins are authorized to use all available licenses owned by the account. A standard user will only see the licenses that have been assigned to the user’s account. Once you have selected a license, the sign-on process is completed. You will no longer be prompted to sign-in upon starting the software. 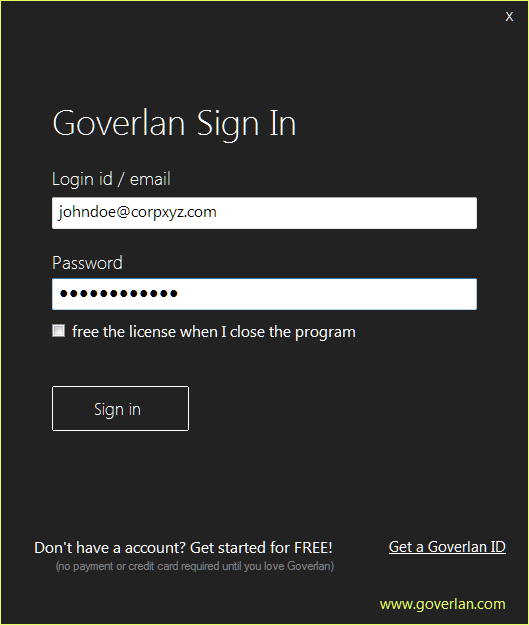 Signing-in to Goverlan uses a license count from the selected license pool. Once all licenses have been consumed, any subsequent sign-on will fail. Fixed License Sign-in to the Goverlan product permanently. The license allocation kept for you and is released only when you manually sign out of the product via the license information panel. Floating License Temporarily allocate a license to access the Goverlan product. If the Goverlan product is closed. If the product is not used for a configurable period of time. If you opened the product via an RDP session and this one is disconnected. To enable Floating License mode, check the free the license when I close the program during sign-in. The host unique identifier contains private information. This data is transferred over our secure servers solely to facilitate license usage management when you use the client online portal (see Viewing and Managing License Usage). However, if your security compliance policy forbids the transfer of confidential company information, Use the License Service Global Policies to set a policy on your network to prevent real identities from being used. In this case the host ID will be a random unique identifier. See: License Services Global Policies. This panel provides product, license, and account information as well as controls for each section. Some sections and actions are only available if you signed in with a license administrator’s account. What if my license feature set has changed? A license has features associated with it. If the license’s feature set used to activate the product has changed, you must click on the Refresh option in the License Information section to reload the license. How do I release my license? If you wish to release the acquired license, or wish to sign-in to a different license, you must sign-out of your product. To do so, open the application information panel and click on the Sign out option under the Goverlan Account section. What if I don’t know my ID or password? 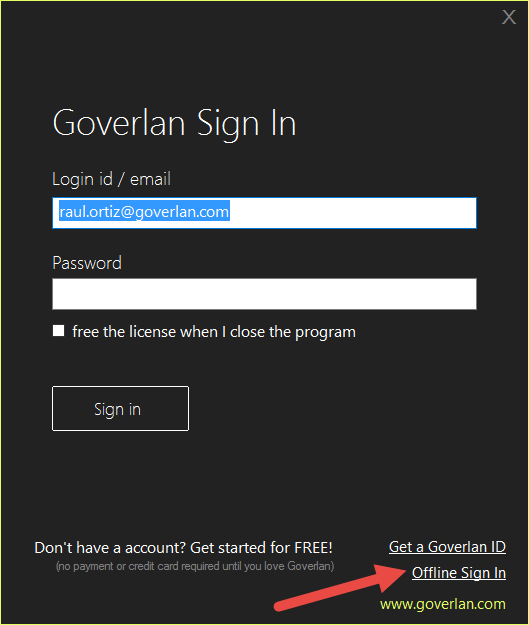 If you do not know your Goverlan Login ID, you must contact the Goverlan license administrator that has been assigned to your company account. Use this link to proceed to a password reset. What if I don’t have internet connectivity? Implement an On-Premise Goverlan Licensing Services and enable Silent License Distribution. The Goverlan solution includes a set of License Policies that can be distributed via a Group Policy Object, the Goverlan Reach Server or direct registry modifications. 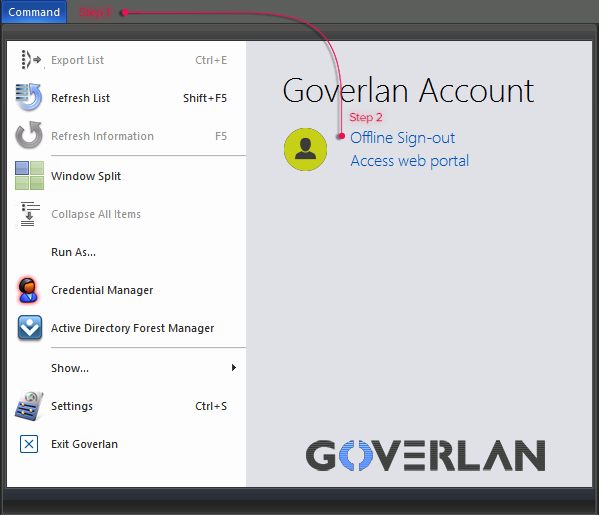 How to configure and distribute Goverlan policies is outside of the scope of this user guide, please refer to the Goverlan Reach Server user guide for further information. As policies are added regularly, make sure to run the latest version of our products. Do not use real identities Set to True if you do not want user and computer identity to be transmitted during license registration. NOTE: If you enable this feature, you will not be able to identify individual users in the client portal. Auto-Release Floating License on User Inactivity Set to the number of minutes of user inactivity upon which to auto-release a floating license. 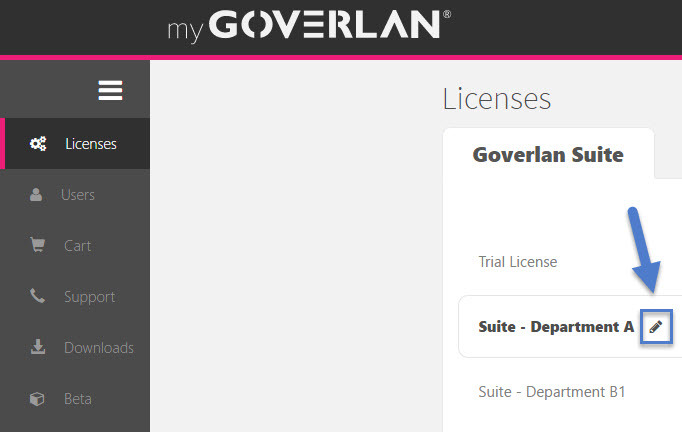 The my.goverlan.com portal allows you to review and manage your licenses and licensed users. The Licenses area displays the products you can use and the license associated with these products. Initially, you will only see a single product and a trial license. However, as you purchase more licenses, they will be displayed in this area. You can browse through your products and product licenses to view their status, features, and authorized users. The Goverlan Reach Server product requires a unique license per instance of the server. You cannot use a Goverlan Server license to sign-in to two different servers. You can, however, have an unlimited number of Goverlan Server licenses. If your company owns more than one license for a product, you have the option to rename them to facilitate license selection during sign-on. The name of the license can be used to describe the features enabled on this license, or to allocate license pools to specific sub-organizations of your company. To rename a license, select it, place your mouse cursor over the license name and click on the edit button. Admin Admins have full access to the entire Goverlan company account. 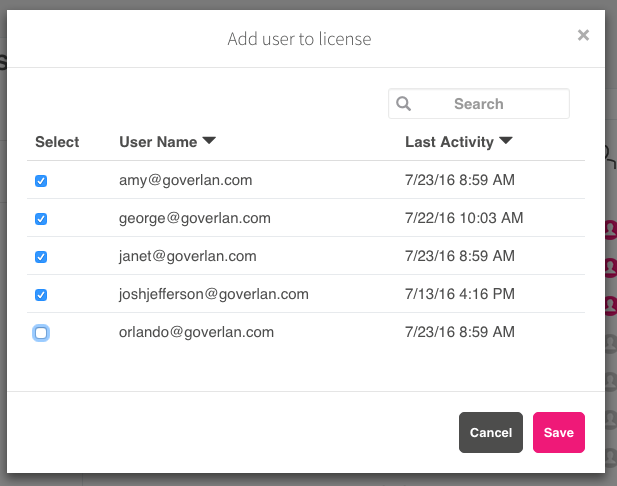 Admins can add new users, assign user licenses, revoke licenses, purchase new licenses, or perform other management tasks. User Users can only consume a license that has been assigned to them and manage their own license consumptions. An Admin account is authorized to consume any licenses. However, a standard user account can only consume the licenses that have been assigned to them by a license administrator. As an Admin, you can create as many user accounts needed for your company. You may choose to only create a single common user account to be used by all operators, or create a unique user ID for each operator. Enter the User ID to define this user. A user ID must be in the format of an email address. Enable Use user ID as notification email, if the user Id is entered above can be used for email notifications (for instance when sending password information). Disable this option to specify an alternative email address to be used for notification. If the new account created is a standard user, you will be prompted to select the licenses you wish to assign to this new user. Select one or more licenses and continue. All information of a user account can be edited, except for the user ID. To change the user ID of an account, you must first delete it then recreate it. To edit your account’s information, click on your account icon in the header bar and select Settings. To reset the password of a user account, click on the Reset option for that user. A reset action changes the account’s password to a temporary one and emails the password to the user (using the configured notification id). To delete a single user, click on the Delete option for that user. To delete multiple users, select each account in the list using the checkbox then click on the Delete option at the bottom of the table. Upon deleting a user account, you will be prompted if you wish to revoke all licenses consumed by the account. Opting for the revocation of the user licenses will force a new license acquisition for all product instances that were signed in with that account within 24 hours. In order to use a license (by signing into a software product), a valid Goverlan account must be used. By default, an Admin account can use any licenses. However, a standard user account can only use the licenses that have been assigned to them by a license administrator. Place a check mark for all users to grant them access to that license and then click Save. The following permissions will be added to the Goverlan Portal. These permissions apply to all USER accounts, not admin accounts. The permissions range from least restrictive to most restrictive. Allow users to revoke own licenses: Users will not have access to any self-service resources but can revoke and change their own passwords. 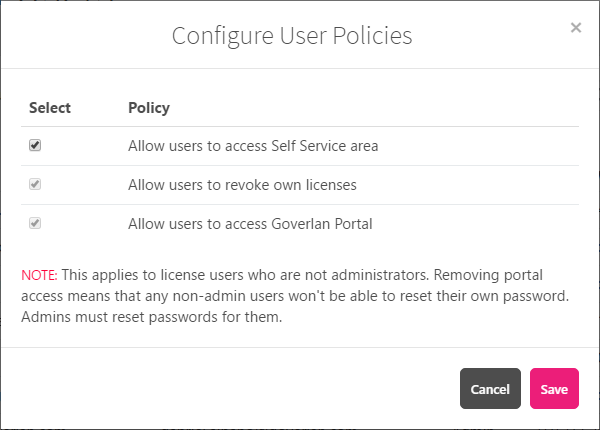 Allow users to access Goverlan Portal: This permission will allow the user to change their own password only and view license data only. Removing all the permissions will result in the account users not being able to log in to the portal. They will need to contact their license admin for any changes. The license information panel includes a Status area that displays the amount of authorized product licenses (“owned”) and allocated product licenses (“used”). 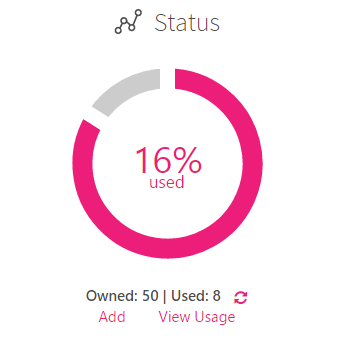 To view the accounts consuming a license, click on the View Usage option. The Host column displays the host identifier of the session in which the product license was used. This host string is provided to facilitate the identification of the consumer. However, if you have enabled the No Real Identity policy (see License Services Global Policies), this column will only display a random unique string. In order to re-claim a license usage, Goverlan Operators must sign-out of the software. However, in the event this operation is not possible, you can revoke a license from the client portal. 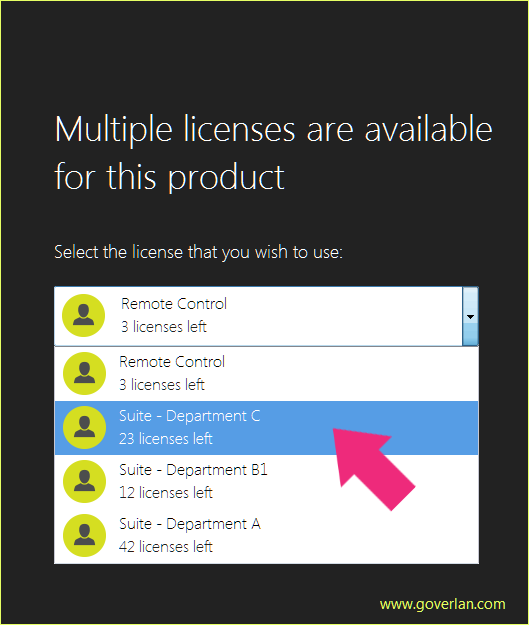 To revoke a single license usage from the portal, click on the revoke option of desired license usage row. To revoke multiple license usages, select the checkbox for the desired rows and click on the revoke option at the bottom of the table. Once a license usage has been revoked, the affected operators will be signed-out of their product within 24 hours. Revoking an Offline Sign-On requires an Offline Sign-Out Confirmation Code (see Off-Line Sign-on of Operators). Click the link to download the latest available versions of the licensed product. For perpetual licenses, the accessible product versions a released within the terms of your maintenance contract. You can also easily access the latest version of our product by opening the Downloads area of the portal. In the event internet connectivity is not available from Goverlan Operator’s machine, it is preferable to implement On-Premise Goverlan Licensing Services. If the Goverlan Licensing Services cannot be implemented, then use the method described in this section. 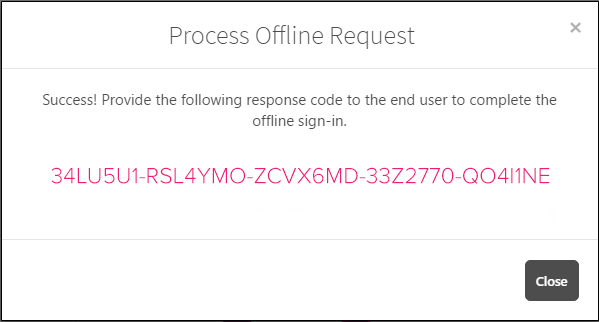 Use this action to process an Offline Sign-On request or an Offline Sign-Off confirmation generated by a Goverlan Operator. Offline license operations allow Goverlan Operators to use our products on a system that does not have internet access or has strict firewall/web proxies. Offline Sign On only supports Fixed Licensing. Floating licenses cannot be configured. Offline Sign On are bound to the license expiration date and product version. 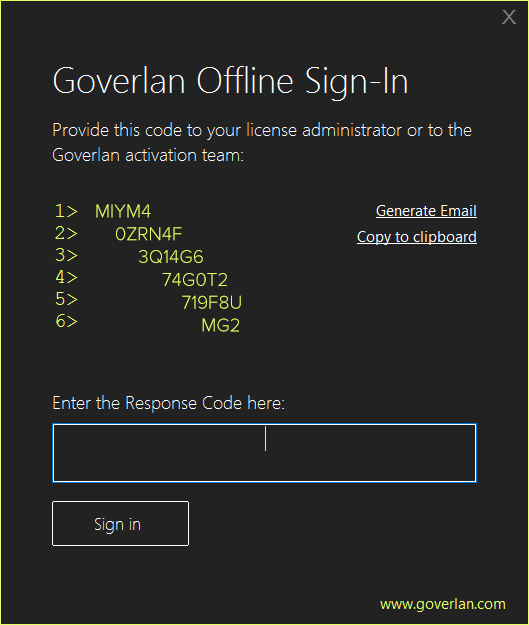 At the anniversary of the license expiration date, the Goverlan software may require a new Offline Sign-On operation. 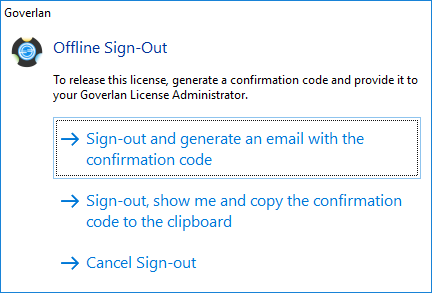 Select Generate Email or Copy to Clipboard to deliver the code to your license administrator. Log in to my.goverlan.com and select the license to be consumed by this request. To reclaim a license acquired via an Offline Sign On, an Offline Sign Out must be performed. Transmit the Sign-Out Confirmation Code to your license administrator. 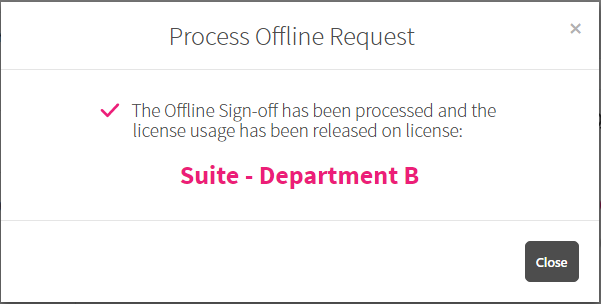 Select Process Offline Request from any license object and paste the Confirmation Code into the field to release the license. What if the Confirmation Code is lost or was never sent? Ask the Goverlan Operator to reopen the Goverlan software and sign in again. This must be done under the same Windows account and the same machine as the previous sign-in. Once signed-in, ask the Goverlan Operator to sign-out again out of the software. If this operation is not possible, you will not be able to revoke the license usage. In this case, please contact Goverlan Sales for assistance. Use this method if you do not wish to distribute sign-in credentials to Goverlan Operators, or if you wish to have Goverlan sign-in automatically. You must also use this method if Automatic License Distribution via an On-Premise Goverlan Licensing Services cannot be used. 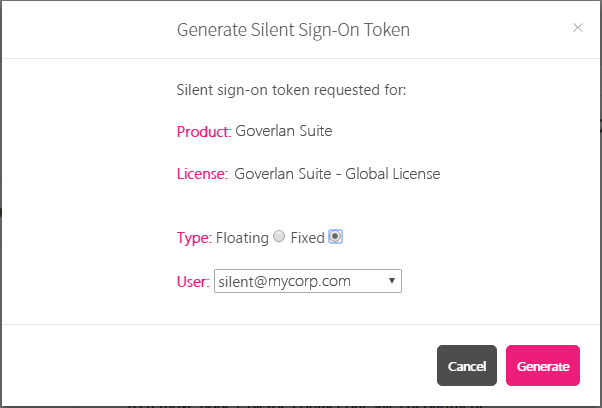 Silent Sign-on works by generating a sign-on token and distributing this token alongside with the Goverlan software installation package, or pre-configuring this silent sign-on on your operator’s machine prior to the installation of the product. A silent sign-on token must be associated with a non-admin authorized user id. This is important as it allows you further controls once the silent sign-on has been distributed on your network. As a best practice, you should create a standard user id: silentsign@yourcorp.com and associated to your license. Select the user to associate with the sign-on as well as the license delivery type (Floating or Fixed). The click on Generate. As a single sign-on is distributed via the registry, it is accessible to anyone. It can then be used on any machine and consume your license count without your approval. By associating your silent sign-on token to a dedicated Goverlan user account will allow you to detect this situation more quickly. To disable a Silent-Sign-On token, you must delete the user id associated with it or de-authorize this user from the license. Then a new silent sign-on must be generated. If internet access is not available from the Goverlan Operators’ machines, or if silent license distribution is desired, the On-Premise Goverlan Licensing Services need to be implemented on your network. 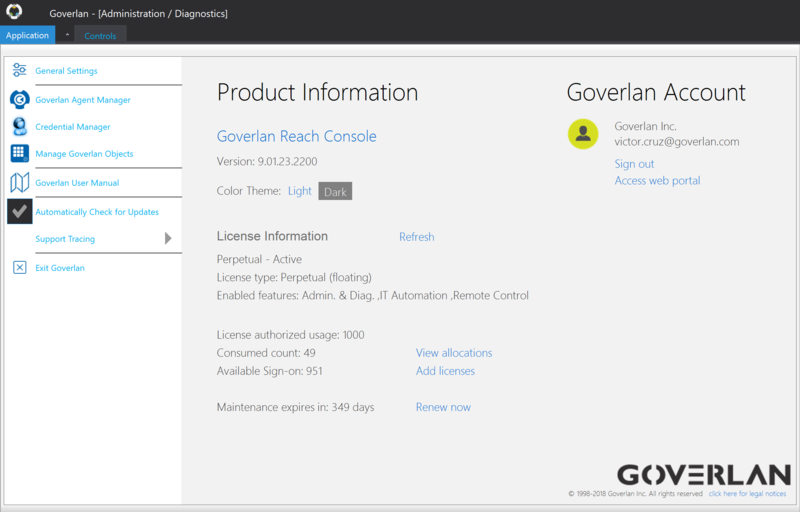 The Goverlan Licensing Services are implemented via the Goverlan Reach Server (a free component to our client).